At the invitation of Austrian Federal Ministry of Europe, Integration and Foreign Affairs, League of Arab States and State of Qatar founders of Nahda Foundation were invited to represent Poland at IV Arab-European Young Leaders Forum in Doha, Qatar that was held on December 4th-9th, 2016. As a direct result of the efforts of Austria, and in cooperation with the League of Arab States (LAS), the Arab-European Young Leaders Forum (AEYLF) was introduced in 2009 with the goal of deepening the understanding and co-operation between emerging leaders of these two neighboring regions. The League of Arab States and Austria have been engaged in this important activity since then. Austria is an observer to the League of Arab States. AEYLF presents a platform for regular and continuous exchange on common challenges and concerns. Young leaders representing politics, civil society (NGOs, foundations, media) and the economic sector are at the center of this initiative, with the objective of discovering and realizing their potential as “multipliers”. The forum constitutes a unique opportunity for participatory and solution-oriented co-operation in a time when innovation and a deeper comprehension of our diverse societies are key to success. 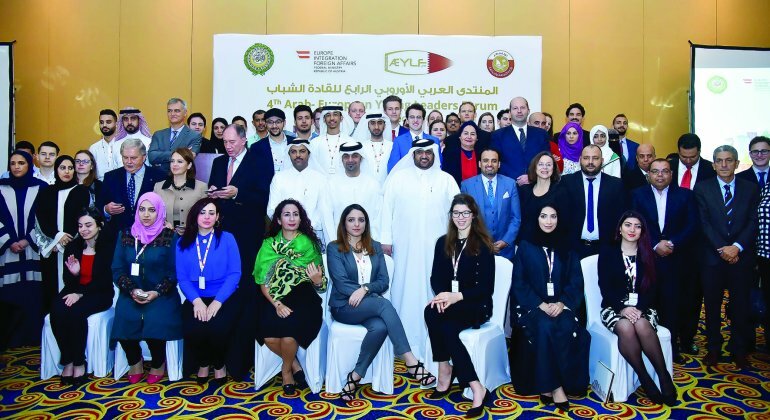 Qatar was the host of AEYLF IV, which took place from 4 to 9 December in Doha. The three themes of this meeting were Youth in Intercultural Dialogue and Non-Formal Education; Youth Economic Empowerment and Future Economic Livelihoods, as well as Youth and Sustainable Development ‒ Protecting the Environment. d) involve young people in critical thinking and the evolution of youth development programs that contribute the advancement of the Arab European youth work. Participants of AEYLF IV have been selected for their outstanding personal and professional achievements and experience at a young age, competence and initiative which they will share with participants from different sectors, backgrounds and cultures. Please, read the article at The Peninsula Qatar’s daily newspaper about the event.